Cafe Ana, photo by Leela Cyd. The long-anticipated Cafe Ana is now open across the street from the historic Santa Barbara County Courthouse, in the Arts District neighborhood, and we’re so excited to have this new “fine-casual” cafe downtown. 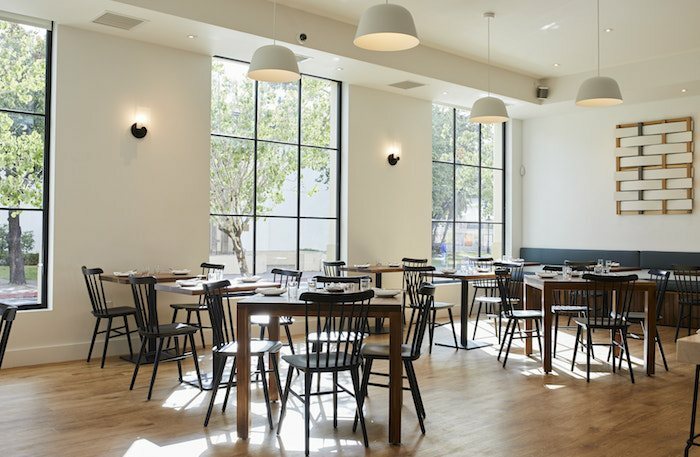 Located at 1201 Anacapa St., at the corner of Anacapa and Anapamu streets (hence the clever name “Cafe Ana”), the former Coffee Cat location has been reborn into a beautiful, light-filled space offering specialty coffee, a curated wine and beer program, and a vibrant menu from Chef Ryan Whyte-Buck. The menu offers both unusual and classic dishes for breakfast, lunch and light evening fare. 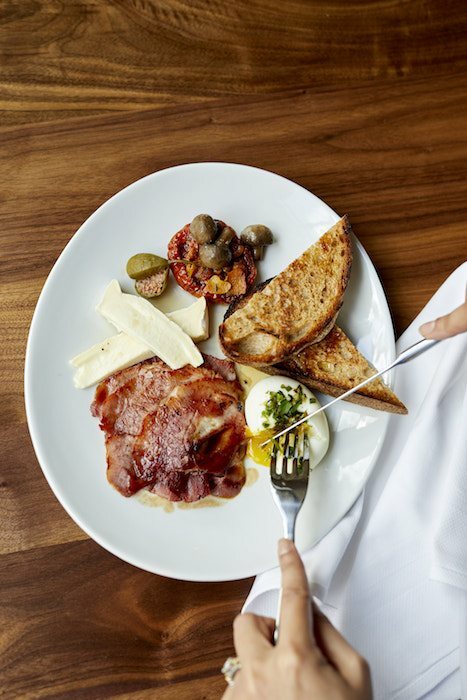 Yummy breakfasts include Housemade Yogurt with Granola alongside a classic warm Sausage, Egg, and Cheese sandwich and a platter that includes soft egg, cheese, sliced ham, and a seasonal assortment of sides. 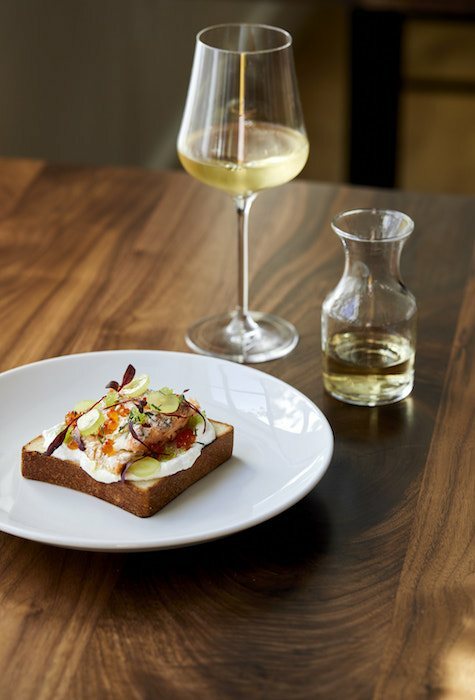 A selection of toasts, such as Salmon Conserva Toast, and Avocado & Cucumber Toast with Pickled Onion and Togarashi Shichimi, are available all day. Lunch features salads like Golden Beets with Snow Peas, and Baby Kale and Roast Carrot and Squash, as well as a selection of sandwiches and heartwarming soups that are perfect for this cooler weather. Evening offerings include a variety of small bites like a Housemade Country Pate (I sampled it at the media preview and it was delicious), a Seafood Gratin, a Carta De Musica of the Day (an ultra-thin Sardinian sandwich) and mouthwatering Kettle Chips with Caviar, as well as a variety of other Roe & Caviar options, served by the ounce with accoutrements. A selection of house made pastries is available all day, and brunch and a full dinner service are planned for the near future. Prices are reasonable for downtown Santa Barbara, with pastries in the $2.50-4.50 range, the morning menu in the $8-15 range, afternoon menu in the $5-16 and the evening menu in the $8-18 range. We tried an array of bites at the preview, and honestly, all were delicious. The food isn’t the only thing to get excited about at Cafe Ana. The beverage program, curated by Owner/Beverage Director Julian Sanders, features coffee and tea from award-winning specialty coffee roaster LAMILL COFFEE. The wine list spotlights vineyards from around the world, along with some local gems such as Tyler, Presqu’ile, and Jalama Canon Ranch. Craft Beer offerings include selections from around the country along with some interesting imports. An open kitchen and enlarged windows fill Cafe Ana’s interior space with sunlight and warmth, punctuated with decor that brings together a modern Scandinavian feel with traditional touches. A crisp palate of white and black contrasts with warm walnut accents throughout the space. An eight-seat bar frames the main dining room, with additional seating throughout. Cafe Ana Owners Katherine Guzman Sanders and Julian Sanders, photo by Leela Cyd. Cafe Ana is a project from local company Maxwell Hospitality, which was started by third-generation Santa Barbaran Julian Sanders, his wife Katherine Guzman Sanders, and Julian’s father Richard Sanders. 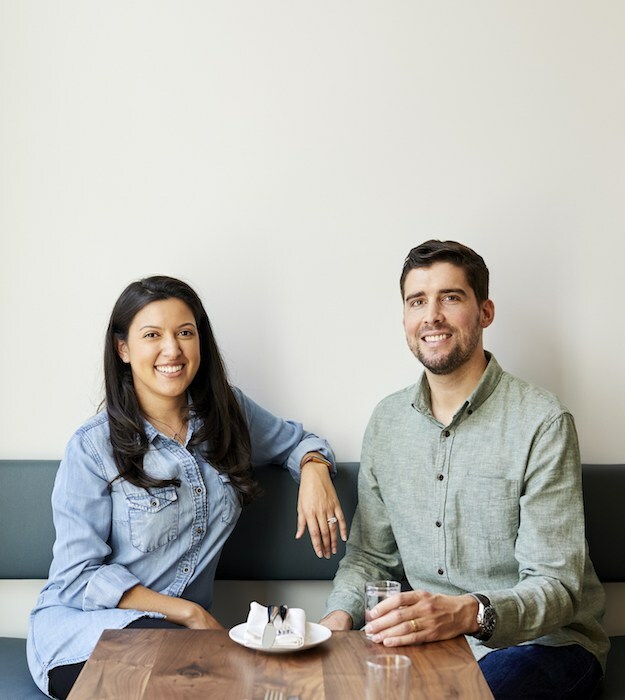 Julian, a certified sommelier and graduate of the Culinary Institute of America’s Accelerated Wine and Beverage program, and Katherine, a front-of-house vet turned hospitality publicist, pooled their passion for the industry with Richard’s local commercial development experience to launch their first restaurant. Cafe Ana is located at 1201 Anacapa St. Current hours are Monday-Friday from 7 a.m. – 7 p.m. For more information, visit www.CafeAnaSB.com. Originally published in Santa Barbara Seasons on December 20, 2018. 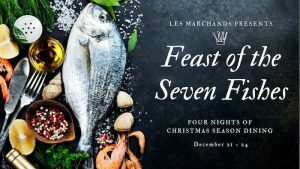 Chef Weston Richards designs a modern take on an Italian Christmas Eve tradition, served from Friday, December 21 through Christmas Eve, Monday, December 24 at Les Marchands Restaurant & Wine Shop, in Santa Barbara’s Funk Zone. For these four days only, Chef Richards features his contemporary Central Coast feast, adapted with Santa Barbara-sourced seafood. 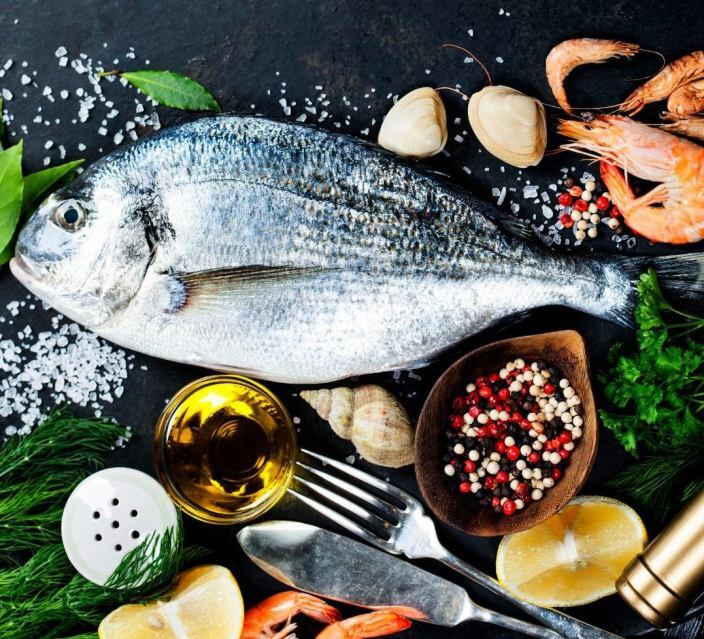 “Feast of The Seven Fishes” first emerged in the United States in the 1900s, when Italian-Americans celebrated the holidays with a multi-course meal of seven seafood dishes, bringing together family and friends to commemorate Christmas. Expect inspired wine pairings from France, Spain, Germany and Hungary for each course selected by Les Marchands’ Wine Director Hayden Felice, and expertly mixed craft-cocktails from the talented bartenders perfect for guests’ individual tastes. 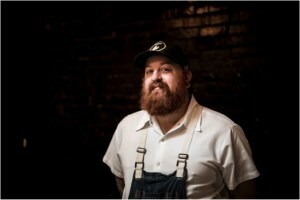 Les Marchands’ Chef Weston Richards, photo by Rob Stark. Les Marchands, photo by Kate Winter. Reservations may be booked by phone or online at www.opentable.com and are available from 5 p.m. Space is limited. For information call 805-284-0380 or email Info@Lesmarchandswine.com. 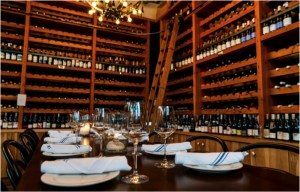 Les Marchands Restaurant and Wine Shop is located at 131 Anacapa St., Ste. B, Santa Barbara, at the Corner of Yanonali and Anacapa Streets. Originally published in Santa Barbara Seasons on December 15, 2018. Outpost Executive Chef Damien Giliberti, photo by Nicole Lazar. Outpost at the Goodland recently promoted Damien Giliberti to Executive Chef, and if our recent meal was any indication, the Kimpton-run property made a great decision to put the kitchen in his capable hands. The property’s former Executive Sous Chef, Damien Giliberti, a native of Northern New Jersey, worked at Finch & Fork for four years, then Outpost for the past two years. He draws his culinary inspiration from his Italian-American upbringing, where his family owned and lived next to their pizzeria. 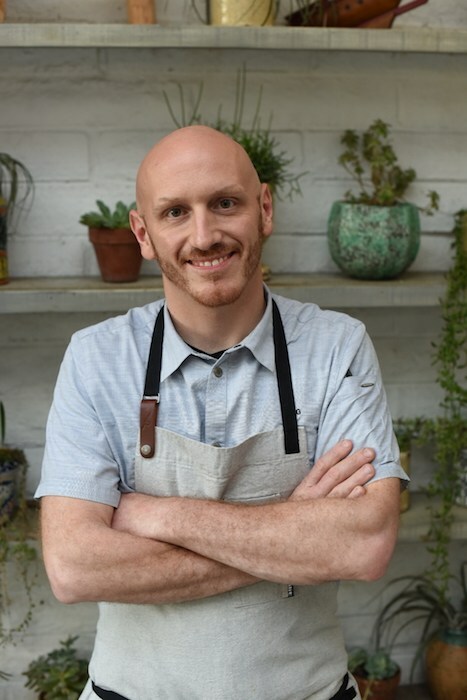 A graduate of Johnson and Wales University in Miami, he worked in kitchens from North Carolina to Miami, before heading West to Santa Barbara, where he now specializes in contemporary and rustic American cuisine with touches of Latin and Asian influences. 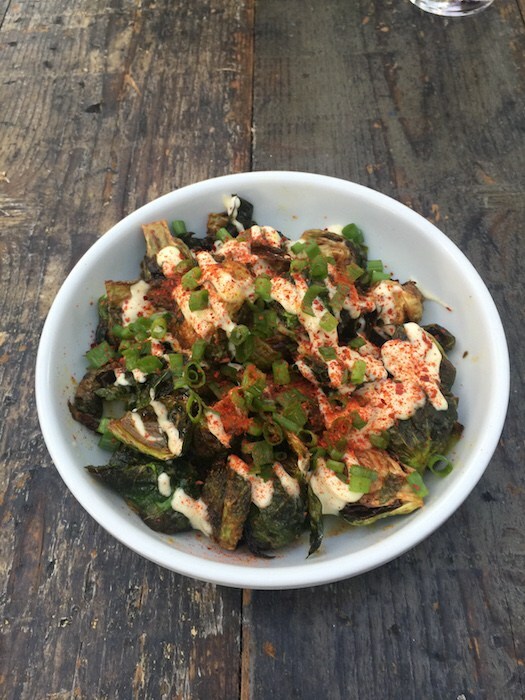 Outpost’s Fried Brussels Sprouts with Yellow Curry, Roasted Garlic Aioli and Chili Flakes, photo by Leslie Dinaberg. Our dinner started out with one of my favorite dishes of the night, Fried Brussels Sprouts with Yellow Curry, Roasted Garlic Aioli and Chili Flakes. Brussels Sprouts are, as they say, “having a moment” on local menus, but this preparation was both unique and delicious, with the warm notes of curry trumpeting the beginning of the fall season. Outpost’s Tuna Crudo with Yuzu Dressing, Fuji Apples, Avocado Puree, Red Radish and Chili Oil and Some Like It Hot cocktail, photo by Leslie Dinaberg. Next up was a bright Tuna Crudo dish with Yuzu Dressing, Fuji Apples, Avocado Puree, Red Radish and Chili Oil, followed by another fall favorite, Carmelized Sweet Potato with Tumeric Yogurt, Crispy Chickpeas and Garam Masala. 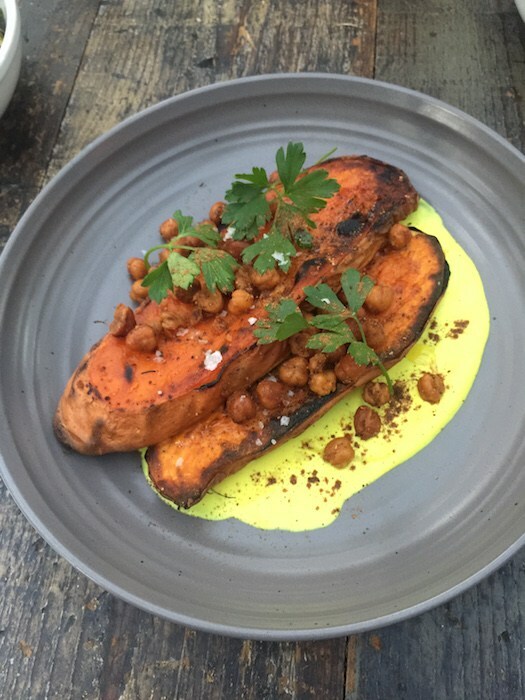 Outpost’s Carmelized Sweet Potato with Tumeric Yogurt, Crispy Chickpeas and Garam Masala, photo by Leslie Dinaberg. 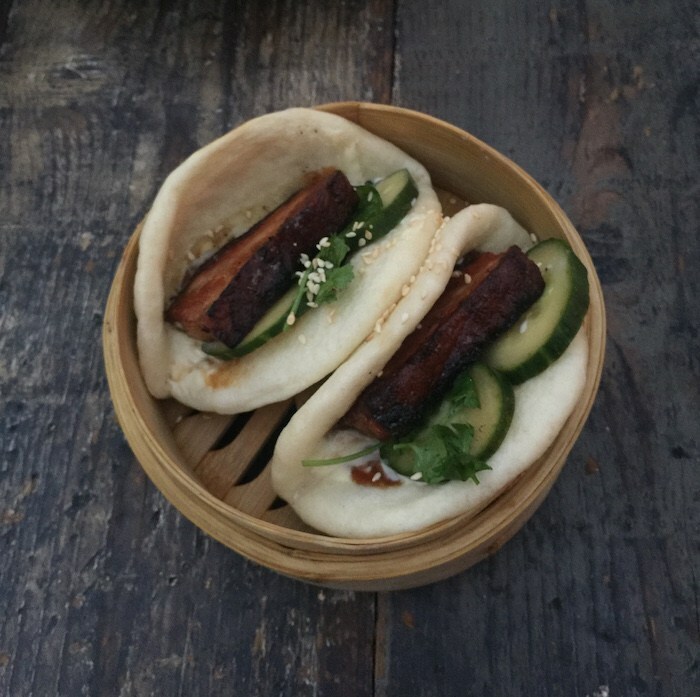 We also loved the Pork Belly Bao Buns (even my sometimes vegetarian friend indulged) with Pickled Cucumber, Jalapeno Kewpie, Sesame Seed, Cilantro and Hoisin Sauce. The larger entrees—Pork Chop with Carmelized Fuji Apples, Spicy Mustard Aioli and Upland Cress; and Salmon with Romanesco Puree, Roasted Heirloom Carrots, Sauteed Sugar Snap Peas and Chipotle Hollandaise—were also very tasty. Other new menu highlights include the Lamb Burger with Date Chutney, Harissa Yogurt, Pickled Red Onion and Watercress; and Grilled Strip Loin with crispy Red Potatoes, charred Mexican Green Onions and Chimichurri Sauce. 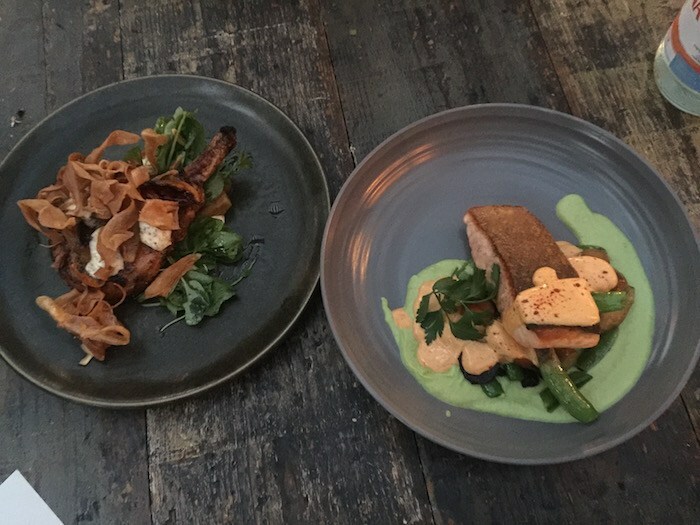 Outpost’s Pork Chop with Carmelized Fuji Apples, Spicy Mustard Aioli and Upland Cress (left), and Salmon with Romanesco Puree, Roasted Heirloom Carrots, Sauteed Sugar Snap Peas and Chipotle Hollandaise, photo by Leslie Dinaberg. “Working and living in Santa Barbara has allowed me to experience first-hand how food brings people together. It feels good to be a part of a community like ours, and to connect with our guests through food,” says Giliberti. With food like this, let’s hope he continues to feed our community for a good long time! Outpost at the Goodland is located at 5650 Calle Real, Goleta. For more information, visit www.OutpostSB.com. Originally published in Santa Barbara Seasons on September 14, 2018. 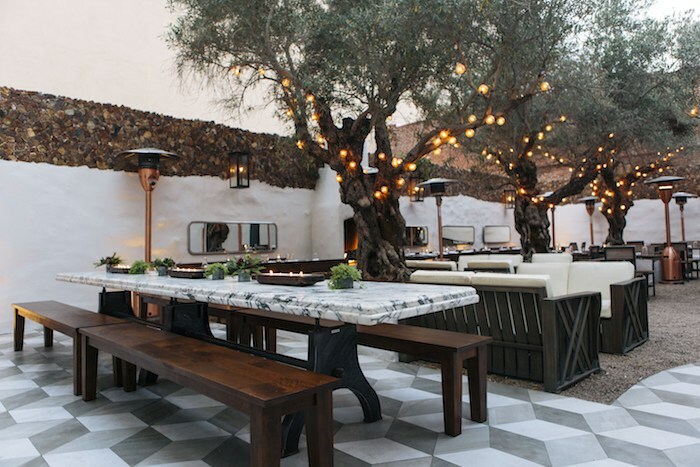 The outdoor patio at Kitchen + Bar is a beautiful place to dine, day or night. Photo courtesy Smithy. There’s nothing better than good food in a beautiful setting, and the new Smithy Kitchen + Bar (7 E. Anapamu St.) has both! I’ve dined on the lovely outdoor patio—under its gorgeous canopy of 100-year-old olive trees—twice in the last few weeks—once on a cold night and once on a warmish one—and the well-placed heaters make it a comfortable and cozy spot to be in almost any weather. Designer Steve Hermann has redone the former Somerset space in an upscale yet approachable style, with a more “Santa Barbara” vibe and every day price point. Originally a blacksmith shop, hence the name “Smithy,” this prime downtown location (near the Granada Theatre, Santa Barbara Museum of Art, Public Library and Sullivan Goss Gallery) is now a great spot for lunch, dinner with friends and family, nighttime drinks and bites or a leisurely Sunday brunch. There’s also a special Easter Brunch menu, if you’re eager to check it out this weekend. 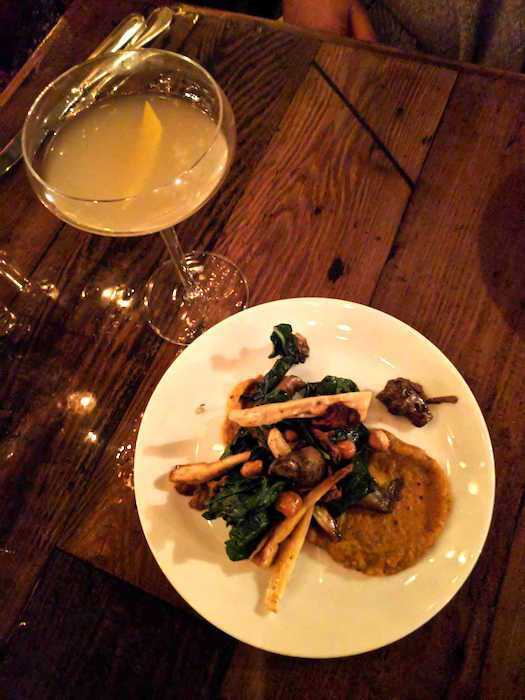 Smithy’s “Baby I’m a Star” cocktail and roasted sunchokes with chanterelles, brown butter hazelnuts and butternut squash puree, photo by Leslie Dinaberg. Chef Lauren Herman’s new menu is delicious, and nothing is over $20. We loved the mussels and clams with shallot, garlic, crispy pork belly, and bok choy served with grilled toast. The sauce was so savory we asked for extra toast (homemade) to lap up every last bite. The pastas were also terrific. Try the Cavatelli combined with pork ragu, mustard greens and tomato confit for a hearty dish. The squid ink casarecce in lobster bisque with uni and nori breadcrumbs was also fabulous. The vegetables really shine as well. We loved the fried delicata squash with cauliflower, bagna cauda, calabrian chili and anchovy aïoli, as well the roasted rainbow carrots with spiced cashew butter, coconut yogurt and carrot top pistou. I also enjoyed the sunchokes, roasted with chanterelles, brown butter hazelnuts and butternut squash puree. Overall, everything was tasty and ideal for sharing. 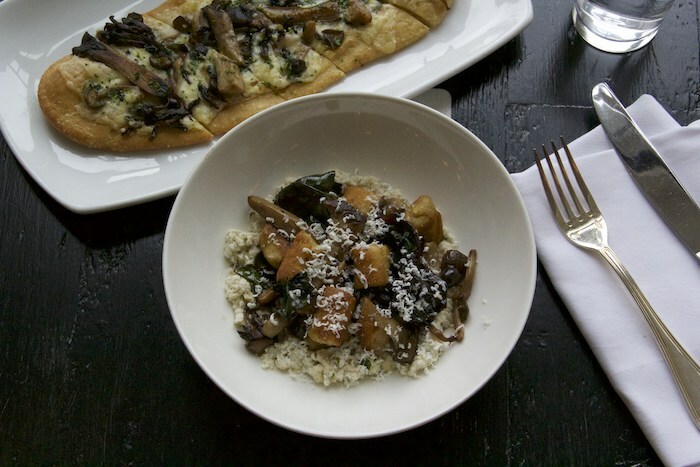 Smithy’s Polenta Dumplings and Mushroom Flatbread. Photo by Kay Cheon, courtesy Smithy. Partners in life and in the kitchen, Lauren Herman’s wife, Christina Olufson, is a terrific pastry chef. The flourless chocolate cake with crushed honeycomb was amazing, as was the butterscotch pumpkin cake. Our friends at a nearby table also raved about the brioche doughnuts, so those are definitely on my list to try next time. The cocktails are also worth noting, with creative names like “Ortega Undead II: The Resurrection” (tequila blanco, lime , thai chile, wild elderflower, falernum and chili-salt rim), “From Tokyo to Mars” (iwai japanese whiskey and bittered grapefruit cordial) and “Baby I’m a Star” (pear and fennel, vodka, fino sherry, absinthe, lemon and peychauds bitters) that are just as delicious as they are irresistible for wordsmiths. 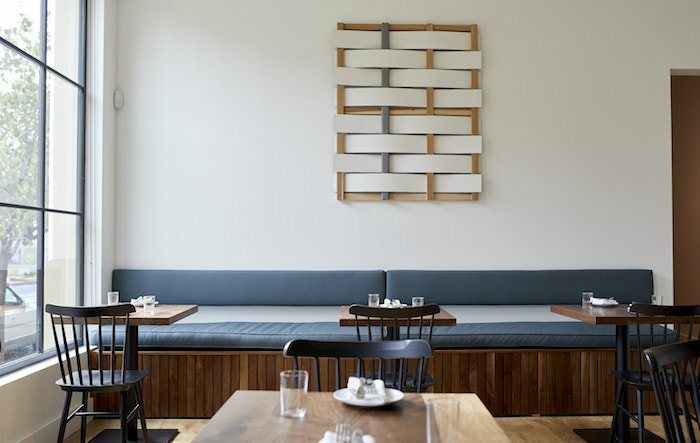 One of several communal dining tables at Smithy Kitchen + Bar, courtesy photo. While I loved the aesthetic of Somerset, Smithy is definitely a more welcoming space, not to mention significantly less expensive. 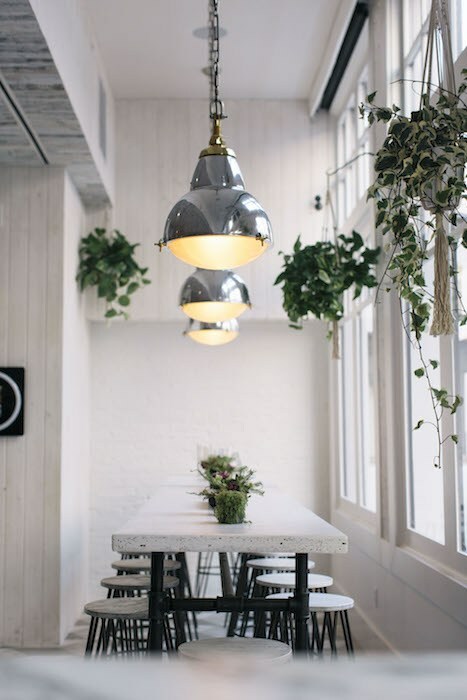 The building’s original exposed brick walls with white weathered board and batten walls, rustic reclaimed table tops, and original school house chairs create a beautiful restaurant that is both airy and open, yet still feels intimate. 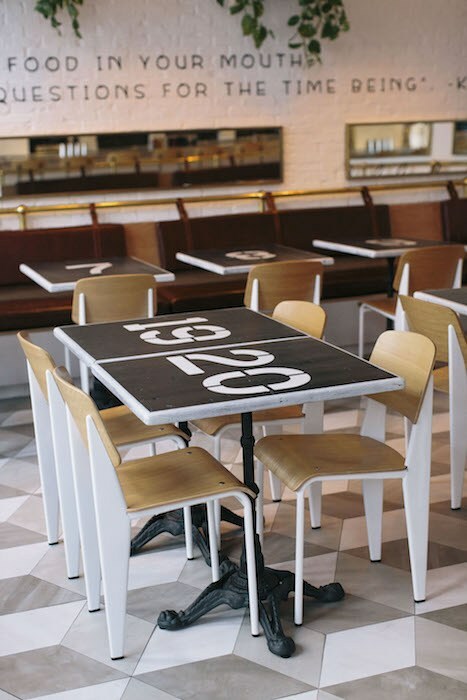 As is becoming a trend, there are three separate communal tables and bar seating, as well as an additional 130 seats located inside and out, offering a myriad of dining possibilities. The nights I was there, there were large groups of people (both young and less young), lots of couples and smaller groups, as well as some solo diners. 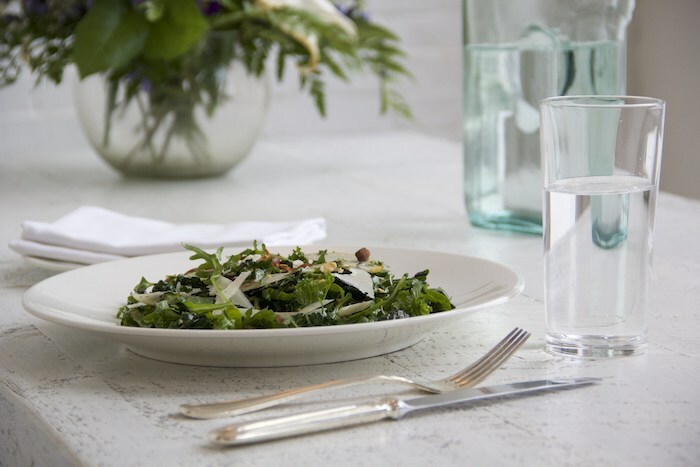 Smithy’s Kale Salad. Photo by Kay Cheon, courtesy Smithy. Smithy is located in downtown Santa Barbara at 7 East Anapamu St. Call 805/845-7112 or visit Open Table for reservations. The restaurant is open Monday through Friday for lunch from 11:30 – 2:30 p.m.; dinner from 5p.m. – close; and Sunday brunch from 10 a.m. – 2 p.m. Happy hour runs daily from 4 – 6 p.m. Originally published in Santa Barbara Seasons on March 29, 2018. Interior shot, courtesy Smithy Kitchen + Bar. 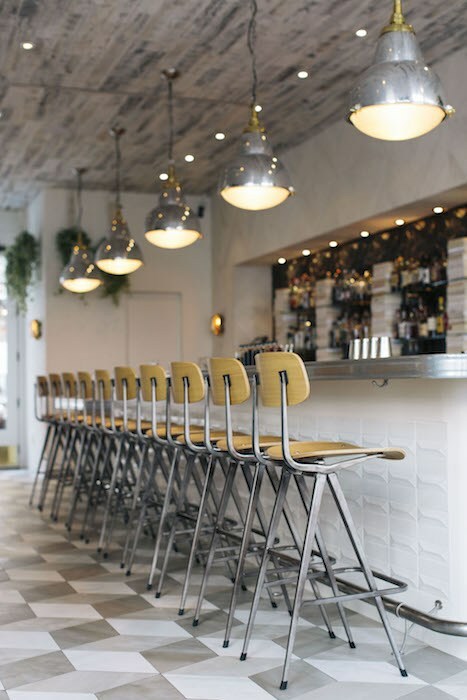 Bar interior shot, courtesy Smithy Kitchen + Bar. 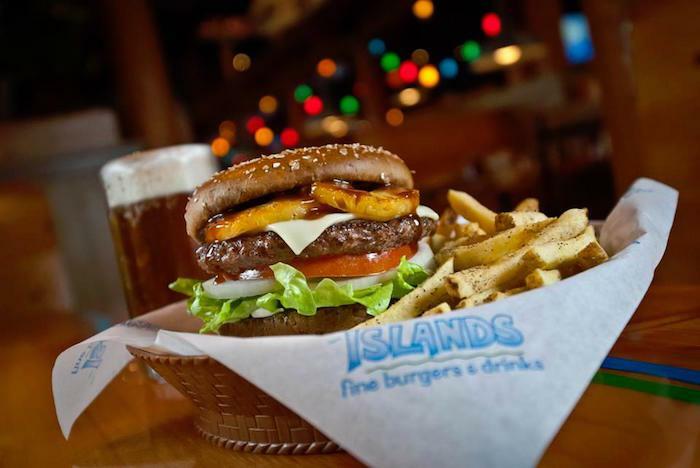 Islands Hawaiian Burger, courtesy photo. Family-friendly and surf-inspired, the new Islands Fine Burgers & Drinks is a great fit for La Cumbre Plaza (3825 State St.). 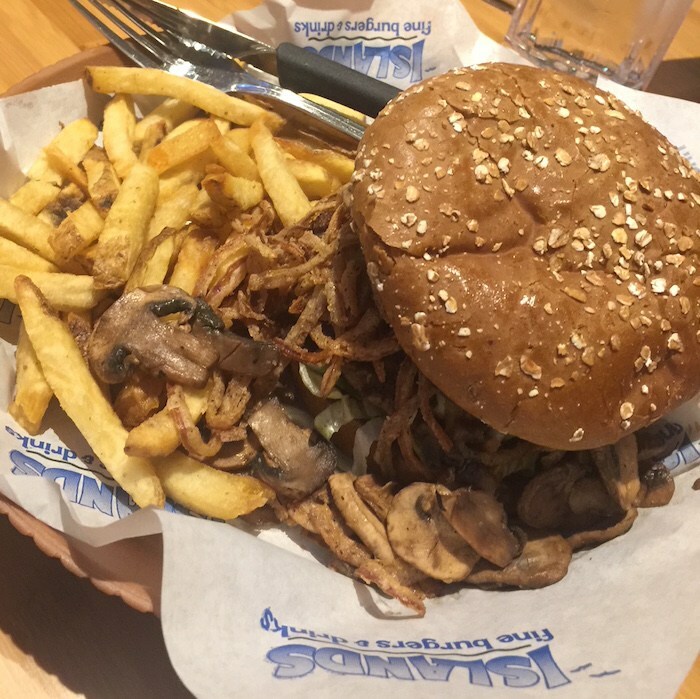 Probably best known for specialty burgers, fresh cut fries and tropical drinks, we tried Islands out recently and it didn’t disappoint. The 4,900 square-foot restaurant (formerly occupied by Marmalade) features an open layout, beach-vibe décor, including surfboard-inspired booths, and a large outdoor patio area, equipped with heaters and a cozy communal fire table. 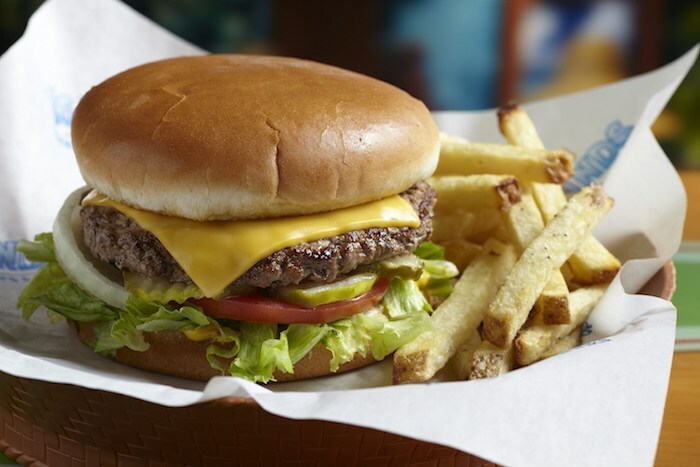 The expansive menu emphasizes burgers, including the classic Big Wave (your basic burger ingredients), the Hawaiian (topped with fresh grilled pineapple, teriyaki sauce and Swiss cheese), and the spicy Kilauea (a Jalapeño & black pepper crusted burger with pepper jack cheese, chipotle aioli, lettuce, tomato and Island Reds, which are fried onion strings), among others, along with tacos, bowls, fresh salads and fresh-cut Island Fries. Islands Big Wave, courtesy photo. In the mood for something sweet? 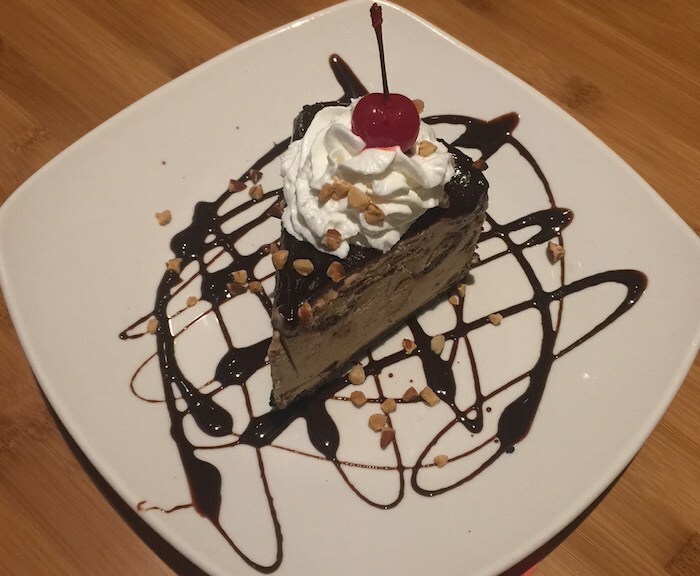 Don’t miss the Kona Pie, made with mocha almond fudge ice cream & cookie crust topped with chocolate fudge, whipped cream, roasted almonds and a cherry on top! Islands Kona Pie, photo by Leslie Dinaberg. I can also vouch for the tropical drink selection. Mojitos, Mai Tai’s, Long Island Ice Tea’s, Margaritas, they’ve got it all, as well as locally sourced wine and beer. They have happy hour weekdays from 3-6:30 p.m., with discounted offers on sliders, nachos, beer, wine and cocktails, as well an all-day happy hour in the bar area as part of March Madness basketball games, in addition to all-day happy hour for Women’s NCAA games for the Final Four (March 30 & April 1). 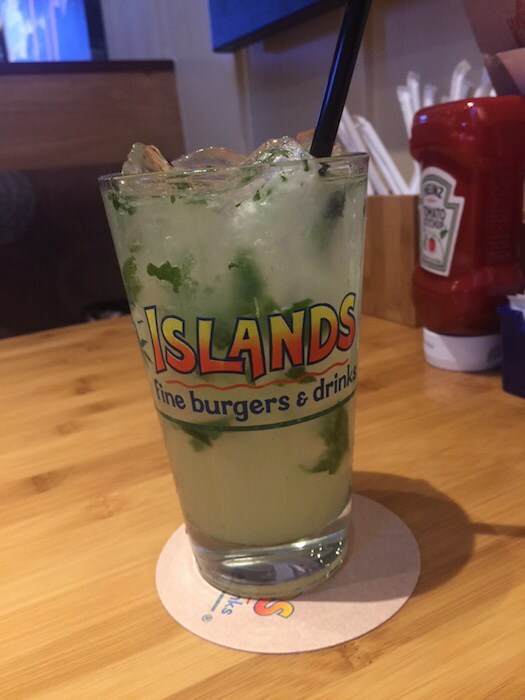 Islands Mojito, photo by Leslie Dinaberg. It’s right in our neighborhood. Perhaps we’ll see you there. 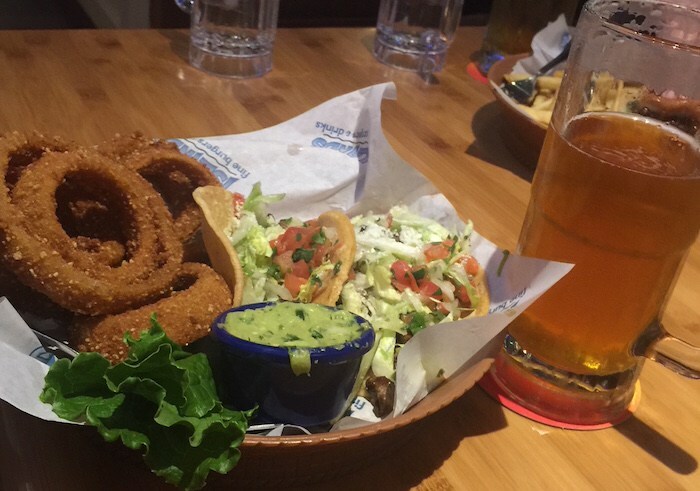 Islands Taco and Onion Rings, photo by Leslie Dinaberg. 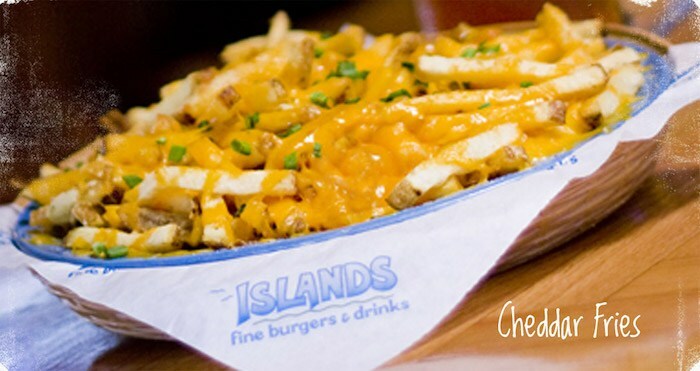 Islands Cheddar Fries, courtesy photo. 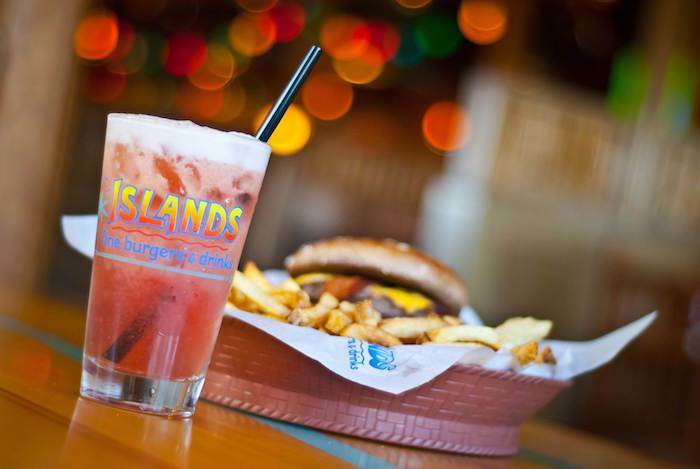 Islands Hula Burger with Island Reds, photo by Leslie Dinaberg. Originally published in Santa Barbara Seasons on March 22, 2018. Guest Chef Vartan Abgaryan of critically acclaimed restaurant 71 Above in Los Angeles (left) joins the Bear and Star Chef John Cox on Tuesday, January 16 for a special Chef’s Table dinner. Courtesy photos. The Bear and Star‘s next installment in their popular Chef’s Table Dinner series features Guest Chef Vartan Abgaryan of critically acclaimed restaurant 71 Above in downtown Los Angeles and takes place on Tuesday, January 16, with two seatings at 6:30 and 7:30 p.m.
Dinner begins with an Amuse – Oyster with Uni, Caviar, Tarragon, Champagne and Parsnip Crème Brûlée; followed by a First of Beet with Tofu, Huckleberry and Black Walnut; then a Second of Sturgeon with Soy Pearls, Black Garlic, Crispy Skin and Finger Lime; Third course of Lasagna with Porcini, Pistachio and White Truffle; Fourth of Turbo with Potato, Leek, Vin Jaune, Meyer Lemon and Smoked Clams; followed by a Fifth of Oxtail with Bone Marrow, Horseradish and Red Sorrel. To finish for a Sixth and final course, guests will enjoy Chocolate with Coffee, Caramel and Pecan. Wine pairings are available for the dinner by The Bear and Star’s General Manager Robert Williams. The Bear and Star’s Chef Room, photo by Kodiak Greenwood. In 2015, Chef Abgaryan joined forces with Emil Eyvazoff to debut a new, world-class dining destination on the 71st floor of the US Bank Tower. At 950 feet above ground level, 71Above is the highest restaurant west of the Mississippi. Offering elevated modern American cuisine, 71Above boasts breathtaking ocean views from Malibu to Laguna Hills, along with spectacular views of the Los Angeles basin and the surrounding mountain ranges. In addition to the magnificent views, 71Above was designed to provide a number of varying dining experiences. Guests may choose to dine within the buzz of the bar or in our adjacent lively main dining room. The Chef’s tables offer views of the open kitchen and transition into a semi-private dining area, offering a quieter and more intimate dining environment. For reservations, call 805/686-1359 to prepay by credit card or visit Eventbrite for tickets. The Bear and Star is located at 2860 Grand Ave., Los Olivos. Originally published in Santa Barbara Seasons on January 9, 2018. 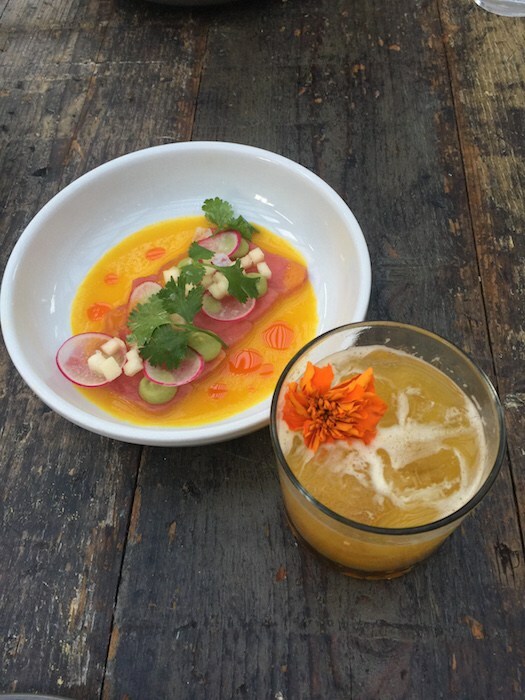 Finch & Fork’s Kanpachi Crudo, photo by Leslie Dinaberg. Some good news for Goleta: longtime Finch & Fork Executive Chef James Siao has taken on the dual role as Executive Chef of the Canary Hotel‘s sister property, Outpost at the Goodland. For the past five years, Siao has done an excellent job creating elevated comfort food at Finch & Fork. Our recent meal was no exception. Executive Chef James Siao, courtesy photo. Leaving our menu in Siao’s very capable hands, we started the evening off with the beautifully bright Kanpachi Crudo, made with avocado and cilantro crema, pickled pearl onions, jicama, yuzu and jalapeño. This was followed by a seasonal salad of Burrata & Heirloom Tomatoes, complimented with stonefruit, kale & pistachio pesto and outstanding grilled bread. Finch and Fork Burrata and Heirloom Tomatoes, photo by Leslie Dinaberg. I could have died and gone to heaven quite happily right there, but Siao continued to bring out wonderful dishes, including a creamy Fresh Ricotta Cavatelli made with spinach, peas, preserved lemon and pecorino; and an incredibly flavorful Cauliflower, with romesco, hazelnut dukkah (an Egyptian nut and spice mix) and lemon. Finch & Fork’s Fresh Ricotta Cavatelli, photo by Leslie Dinaberg. The entrees (yes … there was still more!) were also terrific. A colorful Duck Breast with carrot cardamom puree, farro, onions and blackberry gastrique and perfectly prepared Sea Scallops with gold beet relish, grapefruit, chorizo vinaigrette and sliced avocado. Finch & Fork’s Cauliflower, photo by Leslie Dinaberg. Finch & Fork’s Sea Scallops, photo by Leslie Dinaberg. For more information on Finch & Fork (31 West Carrillo St. at the Canary Hotel in downtown Santa Barbara), visit www.finchandforkrestaurant.com. For more information on Outpost (5650 Calle Real at the Goodland hotel in Goleta), visit www.outpostsb.com. Finch & Fork’s Duck Breast, photo by Leslie Dinaberg. Originally published in Santa Barbara Seasons on September 14, 2017. Angel Oak at Bacara, courtesy photo. Believe it or not, it was about a year that Angel Oak first opened its doors, offering a unique twist on the traditional steak and seafood concept—not to mention that killer ocean view! The signature restaurant of Bacara Resort & Spa celebrates its one-year anniversary with a community party on June 25. To showcase Angel Oak’s appreciation to the local community, the restaurant hosts a “One Under the Sun” party on Sunday from 2 to 5 p.m. The leisurely afternoon includes chef bites, lawn games, live music and dozens of local wine and craft beer tastings. All of the festivities take place on Angel Oak’s expansive outdoor patio and bluff overlooking captivating ocean views. The bar at Bacara Resort & Spa’s new fine dining restaurant, Angel Oak, courtesy photo. Tickets for One Under the Sun are $50 per person, inclusive of tax and gratuity. A special guest room rate starting at $250 (normally $500) is also available. Space is limited. For tickets and more information, please visit AngelOakSB.com. Angel Oak at Bacara Resort & Spa is located at 8301 Hollister Ave. Originally published in Santa Barbara Seasons on June 20, 2017. CPK’s new Fire-Grilled Ribeye, photographed in the CPK Test Kitchen, Redondo Beach, courtesy CPK. It’s hard to believe, but CPK (California Pizza Kitchen) is celebrating its 25th anniversary in Santa Barbara’s Paseo Nuevo this week (located at 652 Paseo Nuevo, http://paseonuevoshopping.com/directory/california-pizza-kitchen/, 805/962-4648). For those of us who remember Piccadilly Square being where the mall now is, it’s hard to believe that the family-friendly favorite restaurant is actually a quarter of a century old! CPK is celebrating with special prizes and deals this week, like in-restaurant restaurant raffles with prizes, including a CPKids party, office catering, and dinner for two; free dessert on Thursday and Friday (their amazingly yummy butter cake or red velvet cake for guests who dine in) and double rewards for Pizza Dough Rewards members, which is a nice deal for regular customers. CPK’s Butter Cake, courtesy photo. We dined there this week and sampled the new menu items from CPK’s “Next Chapter initiative,” which includes additional entree style dishes and a whole bunch of hand-crafted cocktails. Don’t worry, your old favorites like The Original BBQ Chicken Pizza, Thai Crunch Salad and Spinach Artichoke Dip are still there, but there are also some tasty new main plates like a Fire-Grilled Ribeye, Hearth Roasted Haibut and Mahi Mahi Tacos, among others. We also loved the Bianco Flatbread with whipped truffle cream, gorgonzola, mozzarella and fresh sage. Sangria Flight (L-R) Orchard, Red Berry, Harvest, courtesy CPK. Cocktail faves include the Moscow Mule, a Blueberry Ginger Smash (with Jack Daniels) and a seasonal selection of Sangrias—try the flight of three, smaller pours. My favorite Sangria was the seasonal harvest with rum, St. Germain, Chardonnay, mint and basil. This is definitely not your Abuelita’s Sangria, but it’s delicious, refreshing and perfect for summer! Originally published in Santa Barbara Seasons Magazine on July 12, 2016. Chef Peter McNee, courtesy photo. I’m looking forward to tasting what two new executive chefs will bring to our region’s excellent foodie scene. Chef Peter McNee comes to Convivo restaurant and bar at the newly renovated and reopened Santa Barbara Inn (1029 Orilla Del Mar). Describing his style of food “Nomad Italian,” which “draws from different styles and traditions along the way,” McNee comes from the well-regarded “Ill Fornaio” group of restaurants, so I can’t wait to taste what he brings to Santa Barbara (convivorestaurant.com). Outpost Chef de Cuisine Nick Bajal, courtesy photo. I’m also eager to see what Outpost at the Goodland’s (5650 Calle Real, Goleta) new lead chef Nick Bajal brings to the table at the laid-back eatery, which is known for its fresh coastal dishes and inspired street food. Bajal steps up as chef de cuisine after working as Outpost’s executive sous chef since 2015 (outpostsb.com).